DNR officials are encouraging you to “get hooked” on the 2009 Wisconsin Fishing Report. Spring is here, and that means fishing season can&apos;t be too far off. Available right now online , and soon at DNR service centers and select Fleet Farm and Gander Mountain locations, is the 16-page Wisconsin Fishing Report. The DNR&apos;s Alisa Santiesteban says the report is chock full of information for anglers. 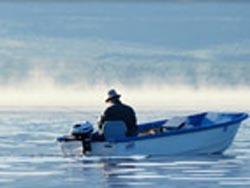 It includes the fishing forecast for the upcoming season, which begins in April. She says there are also schedules and lists of family-friendly waters. Wildlife officials are trying to get more people fishing; especially younger folks. They&apos;ve even started a Fish Wisconsin “Twitter” feed for the tech savvy crowd.